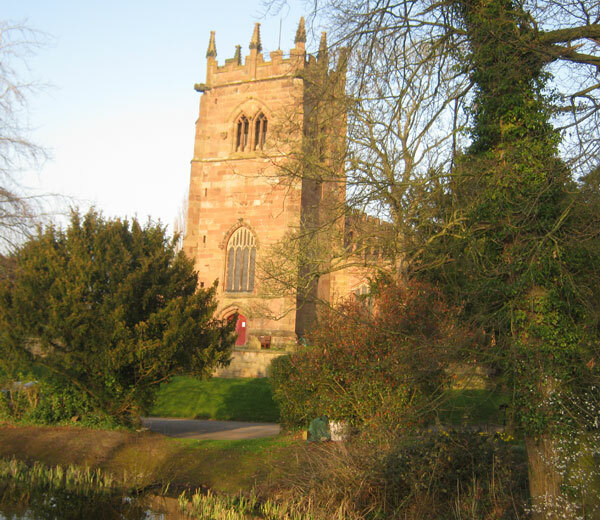 St Bertoline's is the parish Church of Barthomley, a small village in the south-east comer of Cheshire, close to Junction 16 of the M6, 5 miles from Crewe, 8 miles from Stoke and 3 miles from Alsager. Our area postcode is CW2 5PE. Our Church is dedicated to an obscure Saxon Saint, about whom little is known, but many traditions have attached themselves to him. Of noble family, he turned to life as a hermit on an island near Stafford. His local miracle at the site of our Church was to turn bread into stones, having refused to take on the devil's temptation of Christ in the wilderness. St Bertoline's is listed as a Grade I building of architectural and historical importance. The history of the church goes back many centuries. The oldest part of the present building is a Norman doorway of the mid twelfth century, the last remains of the Church built by the Praers family, who were Lords of the Manor for two hundred and fifty years after the Norman Conquest. They were succeeded by the Foulshursts until the beginning ofthe seventeenth century. This family were responsible for the building of the greater part of our present church, including the Nave with Clerestory and Aisles together with their splendid oak ceilings, the Parclose screen in the North Aisle and the Elizabethan High Altar. The Crewe Chapel was added by Sir Ranulph Crewe, shortly after his acquisition of the estate in 1608, to be his and his family's memorial. It contains monuments to Sir Robert Foulshurst of Hundred Years War fame, and a beautiful alabaster memorial to Sybil Marcia, wife of Robert Offley, 2nd Baron Houghton, later Marquess of Crewe. Just before Christmas in 1643 many of the parishioners took shelter in the Church Tower from royalist troops, from which they were smoked out by the soldiers. Despite having surrendered, twelve of the emerging parishioners were murdered. The evidence of the 'Barthomley Massacre' was to have been one of the charges of treason against Charles I, had his trial been allowed to proceed. A full 'walk-around' architectural and historical guide to the Church is available for visitors. We have been engaged since 2010 with the restoration of the stonework of St Bertoline's. The South and North sides of the Church, and the Crewe Chapel were completed in 2011. In 2013 the Church was completely rewired and a new heating system installed. We are delighted to have received recently a substantial grant from the Heritage Lottery Fund for further work, including the restoration of the Tower. This was completed last year (2016).